We need new system design. Sustainability has been important to me as long as I can remember. I started the journey when I was young, with a book my Aunt sent my family: 50 Ways You Can Save the Planet. Until then, I had no idea the planet needed saving. Since, I’ve paired down that focusing on educating people about the environment is one of the reasons I’m here, on this planet. Why do we need to educate ourselves on the environment? Because in our hurried society, we are so busy taking care of basic needs that we either forgot, we’re not taught, or a combination, of all the things that we need. The rampant fires, the rising waters, the continued pollution are all reasons why we need more environmental education. Handily, a friend, in the food buying club world, asked for recent resources on how to do green. Thinking about this, I realized that I don’t turn to too many outside sources anymore. While it’s good to stay up to date on recent bloggers, I have found that following a few basic principles are more key to living a green life. And, funny enough, I got on this topic with my husband the other day. Husband never really understood why I preach a green, organic life. In a fit, I expressed, exasperatedly, it comes down to keeping our basic life resources clean so that our kids and their kids can drink from the tap without fear of contamination. So our kids and their kids can walk outside without a gas mask because the air is so polluted. So our kids and their kids can use the earth without fear it’s so contaminated with pollutants they cannot grow healthy food. The bottom line it’s about a whole life thinking. Thinking in terms of what we need every day and shaping our health around that. It is a simple systems concept, from start to finish. If we reduce the amount of things we take in, we will reduce our output. So, what does that mean in the day-to-day? Let’s take a look at the kitchen. In the kitchen we prepare food, we cook food, we consume food, we clean containers that helped with the whole thing, and we store all the unfinished bits. When we reduce our input, we are using reusable containers, for one. When we wash our dishes, we are using chemical-free agents to do our cleaning, so we reduce our input of more chemicals in the ground and through the water filtration process. When we reduce our input into systems, we are reducing our waste. So, we are recycling and composting as much as we can, based on where we live. A natural consequence of reducing our input will be reducing our output. When we use durable plates and silverware, we simply don’t have to throw away as much. When we use reusable containers for our food waste, we aren’t throwing away plastic bags that held a sandwich. When we buy in bulk, we also have less packaging to throw away or recycle. Coming from this aspect, once you start picking away, one at a time, places where you used to throw something away and you’ve replaced it with a durable good, you’ve already started reducing your waste footprint on the world, and you’ve started being more sustainable. A huge place this waste is found is in food. Have you noticed how much packaging it takes to get our food? I’ve seen Kiwis in plastic clam shell containers, not to mention everything on the inside aisles of a grocery store. An easy way to reduce the amount of output you have is to eat whole foods. Buy apples instead of applesauce. Buy fresh corn instead of canned. Buy heads of lettuce instead of lettuce in tubs. Learn to make your own food with whole ingredients instead of buying cans of soup, sauce, and everything in between. Even if you just pick one thing, you will have begun the waste reduction towards a more sustainable world. I’m not typically a fan of fad diets, but we have found where they have shifted us into better health after letting go of foods that aggravate sensitivities. A few years ago, we began eating in the “Whole 30” way. Basically, we eat a chunk of meat surrounded by vegetables. Whole 30 advocates argue that the added chemicals to our food is making us sick, so eliminate those, and you’ll feel better. Whether you’re eating paleo, keto, or a vegetarian diet – generally speaking, you’ll be eating more whole foods. Whole fruits, whole vegetables, not preprocessed in some plant. The more you get into these diets, you may find yourself making your own broth, roasting whole chickens, and tending after your own hens to get your own eggs out of your own backyard. All of these steps will simply reduce waste in your home. The bonus being, you’ll eat better too! Another important aspect to sustainability is design. Running on carbon stealing, over built, waste inducing design will not solve our world’s problems. You can never change things by fighting the existing reality. 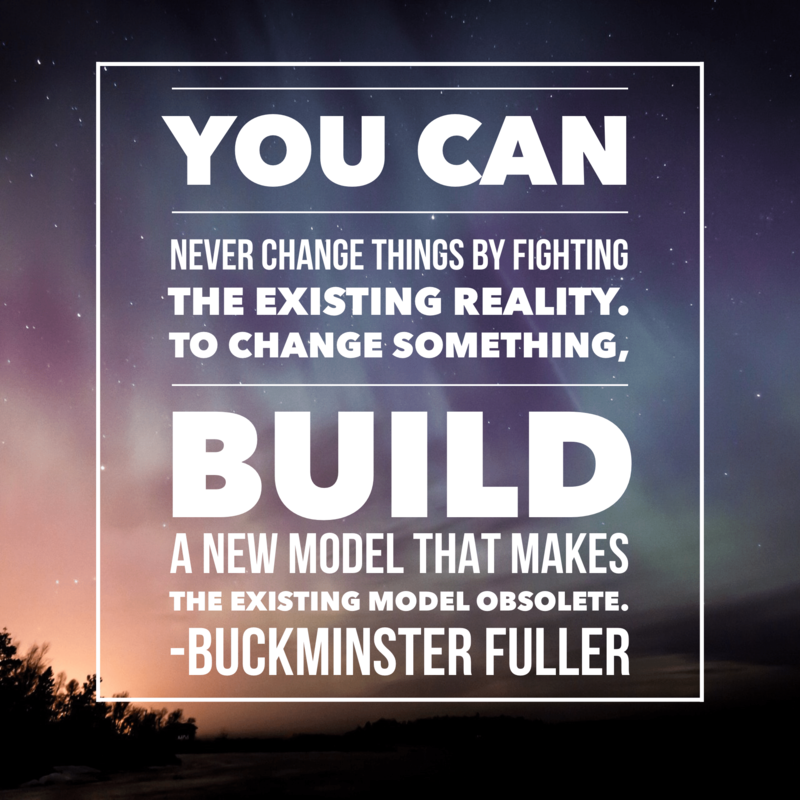 To change something, build a new model that makes the existing model obsolete. We need a new way of thinking about things. Paying attention to new technologies (new ways of designing buildings), participating in politics to update codes (seriously, why is greywater illegal? ), and buying the new technologies as you can afford it (can’t wait to get my Tesla!). All these things will help move us towards a greener world. So, the next question is – what will you do? First, assess where you are. My favorite assessment is “My Footprint”. It’s gotten a facelift since the last time I took it, and it’s still quite informative. Full disclosure – here’s the link to my results: http://myfootprint.org/en/your_results/?id=3357605. On my family’s lifestyle, it would take 3.08 earths to sustain us. While this is much lower than the country’s average, seriously 3.08 earths? I only know of one we can access, today. Try both of these quizzes. My Footprint is great for adults and covers a range of systems that keep us going (http://myfootprint.org), and this Scholastic quiz (for kids) breaks down kid-friendly ways to reduce your impact (http://www.scholastic.com/downtoearth/quiz/howgreenareyou/). Now that you’ve assessed how green you are, what is an easy first step you can take? Where will you reduce your impact? What change do you want to see? Please share your quiz results in the comments below!